Indexed in: Book Citation Index, EBSCO. As a leader in the field of school mental health for nearly 20 years, I continue to be alarmed by the number of youth falling behind academically in the United States. Achievement rates are abysmal, as only 42% of 4th graders are proficient in math and 34% in reading; whereas only 36% of 8th graders are proficient in math and reading (NAEP, 2014). Nearly 20% of youth today do not graduate from high school (DePaoli et al., 2015) and estimates suggest that 7,000 youth drop out of school each day (Balfanz et al., 2009). Youth living in poverty, of color, involved in special education, and those who are English-Language-Learners are at highest risk for dropping out and in turn poor outcomes (DePaoli et al., 2015). The implications are clear. Many youth, especially those most vulnerable, are inadequately prepared to be employable in today’s global economy. As a result, these young people often succumb to the pressures of gangs and other social ills, suffer the consequences of the pipeline-to-prison, and often become over-reliant on government-funded social programs. In addition to the loss of human capital, there also are broader implications for society-at-large. A high school dropout costs the public over $200,000 in government spending over the course of their life (Levin et al., 2007). Further, poor educational outcomes overall make it difficult to attract and retain corporate investments, further lowering tax revenues thereby decreasing public investments in neighborhoods and escalating risk and marginalization (Amos, 2008; Cardichon & Lovell, 2015). So why are so many youth falling behind? Many students come to school with multiple barriers to learning that impede their academic achievement and healthy development. For instance, between 14-20% of children and adolescents experience a mental, emotional, or behavioral disorder each year (National Research Council and Institute of Medicine, 2009). One of every 88 children (and 1 in 54 boys) in the United States have autism spectrum disorders (CDC, 2012). Estimates suggest that 1 in 5 youth are lacking in age-appropriate life/social skills (Blumberg, Carle, O’Connor, Moore, & Lippman, 2008). As a result, many youth are lacking in the social and behavioral pre-requisite skills necessary for success in school and life. Still others suffer from additional risk factors that increase the likelihood for poor outcomes. Over half of all students in the public education system are living in poverty (DePaoli et al., 2015). One of every 58 children is a victim of child abuse and/or neglect each year (Sedlak et al., 2010). Sixty percent of youth have been exposed to violence in their homes and communities in the past year (Finkelhor et al., 2009). Poverty, trauma, and its correlates impact student learning, and also are known to have detrimental long-term negative employment, health, and mental health impacts (Felitti & Anda, 2009; Felitti et al., 1997). Youth today simply are exposed to too much risk. Given the rising prevalence of needs among youth and associated demands placed on the education system, there has been a significant movement toward the adoption of school-family-community partnership models that maximize resources in support of school success (Anderson-Butcher, 2004; Anderson-Butcher et al., 2008). In particular, school mental health (SMH) programs and approaches have become increasingly common (e.g., Weist, Lindsey, Moore, & Slade, 2006; Weist, 2003; Weist et al., 2003; Mellin & Weist, 2011), and have shown promise toward promoting positive academic, health, and mental health outcomes among youth (e.g., Hoagwood, Olin, Kerker, Kratochwill, Crowe, & Saka, 2007; Kutash & Duchnowski, 2011; Suldo et al., 2014; Wilson & Lipsky, 2007). SMH approaches involve universal, school-wide mental health promotion and prevention, assessment, early intervention, and linkage, and intensive interventions/treatment to support the health, mental health, and academic learning of youth today. The evolution of SMH and other approaches, along with the growing needs among youth today, both necessitate that professionals working in and with schools develop new and expanded competencies to support student learning and development. In fact, the Mental Health-Education Integration Consortium (MHEDIC), a national network of academicians, state and agency-level administrators, and practitioners of which I Chair, has called for enhancement of both pre-service preparation programs and professional development opportunities across multiple disciplines. MHEDIC leaders also are envisioning new SMH competencies for educators (Ball & Anderson-Butcher, 2014; Western et al., 2010), school mental health professionals (Anderson-Butcher et al., 2014; Ball et al., 2010), and others working in interdisciplinary school teams and settings (Iachini et al., 2013; Mellin et al., 2011; Michael et al., 2014). Priorities are clear. Educators and others working in and with schools simply need to be better prepared to support young people today who come from increasing levels of risk, often have unaddressed health and mental health needs, and often are falling behind. They need to understand the challenges and issues facing young people today (especially those from diverse backgrounds), be knowledgeable of and skilled in evidence-based practices across the learning support continuum, and be motivated to work collectively on behalf of young people today. To do this work, the field needs resources to utilize in pre-service preparation and training programs, as well as resources to support professional development and capacity-building efforts for those already working in and with schools. This book, Volume II of Mental Health Promotion in Schools (Special Topics, Special Challenges) published by Bentham Science and edited by Raymond J. Waller, builds upon the first Volume (Foundations) and serves as a primary resource to promote competencies among those working in school mental health. He discusses this more specifically below. As such, I am honored to provide the introduction to this book, as it promises to serve as an excellent and unique resource for educators and others who wish to broaden their impact on student learning and development (especially among those with “special challenges’), who aspire to ensure all youth graduate from high school and successfully transition to adulthood, and who hope to further make a difference in the lives of youth today especially those that are most vulnerable. Intentionally promoting mental health is highly correlated with positive school outcomes such as reducing undesirable behaviors, increasing engagement with the school community, and improving academic outcomes. School mental health promotion has evolved to the current standing of an international practice and academic emphasis in its own right, with texts (e.g. Waller, 2006 & Waller, 2012) and academic journals (e. g. Advances in School Mental Health Promotion) as well as support by prestigious centers of research and practice (National Center for Mental Health in Schools at UCLA and Clifford Beers Foundation). 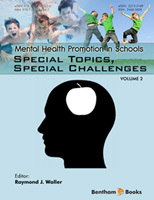 Several approaches were contemplated pertaining to the direction and outcome desired with the second volume in this series, Mental Health Promotion in Schools, before concluding that the logical follow-up to the first volume, Foundations, as well as the best contribution would be Special Topics, Special Challenges. Involved situations or student groups that are not typically considered as potential benefactors of school mental health promotion practices. I would like to express sincere and deep gratitude for the overwhelmingly positive response and participation of the experts who contributed their time and knowledge in generously supporting this work. Distinguished international scholars from Volume I including Howard Adelman, Linda Taylor, Mark Weist, Dawn Anderson-Butcher, Elise Capella, and Steven Little are joined in Volume II by the expertise of, among others, John Miller, Kathleen Rudasill, Bruce Thyer, S.A. Moore and R.C. Mitchell, and Elizabeth Mellin. To the reader, I convey the collective knowledge and experience of the contributing authors. I also extend the invitation of feedback on the volumes already available as well as identified areas of inquiry that you would find essential as we complete subsequent volumes. Most importantly, I hope that the material in Volumes I and II have buttressed in some way your practice interest and efforts in this important topic.